Home » How do I move a recipe to a different category? 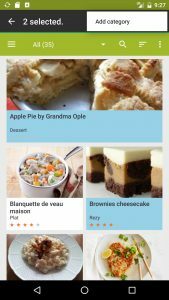 To modify the category of a recipe, open “My Cookbook”. In the “Recipe List”, tap and hold the recipe that you wish to change. You can select the “Add category” option. Then just choose the category, the recipe will be added to that category. A second option is to select the “Modify” (pen icon) option. The “modify” button will allow you to edit the recipe including changing the category. I wish to sort the category list. I also would like to modify the name of the category ie. “Red Meat” after adding “Lamb”, “Venison”. to the category list, making the necessary recipe changes rename “red meat” to “Beef”. I want to add new categories to my cookbook pro android app, but the Manage Categories link does not work. I would like to add more categories to the program. How?